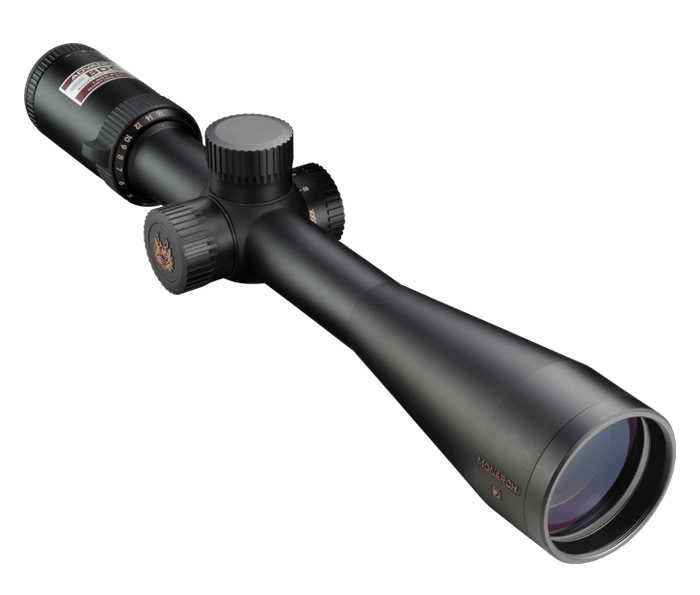 Engineered for minimum weight and maximum strength and durability, Nikon builds these scopes from aircraft grade aluminum alloy and utilizes larger internal lenses for a wider field of view. Larger tubes allow for wider windage and elevation travel, and superior wall strength and durability. The Advanced BDC reticle is uniquely designed with an innovative wind-compensating feature that integrates windage marks to the left and right of the lower sighting post. These windage marks are calibrated for a 10-mile-per-hour cross wind when the rifle is zeroed in at either 100 yards or 200 yards. MONARCH 7 scopes feature massive ocular lenses that deliver a huge, exceptionally bright, high-resolution sight picture and constant, non-critical eye relief that can be used on even heavy recoiling rifles. To simplify field adjustments, MONARCH 7 integrates Spring-Loaded Instant Zero-Reset Turrets and the Locking Side Focus Parallax Adjustment. These technologies minimize parallax and offer last-second pre-shot changes to be made with confidence. The MONARCH 7, like all of Nikon’s riflescopes, is optimized for use with Nikon Spot On™ Ballistic Match Technology. Spot On allows you to discover all of the exact aiming points on your scope’s reticle at various yardages for your specific ammunition and load. Reflex Sights, Red Dot Sights, StabilEyes Binoculars & Specialty Optics.